The night I met Peter Murdoch it was frigid and windy. 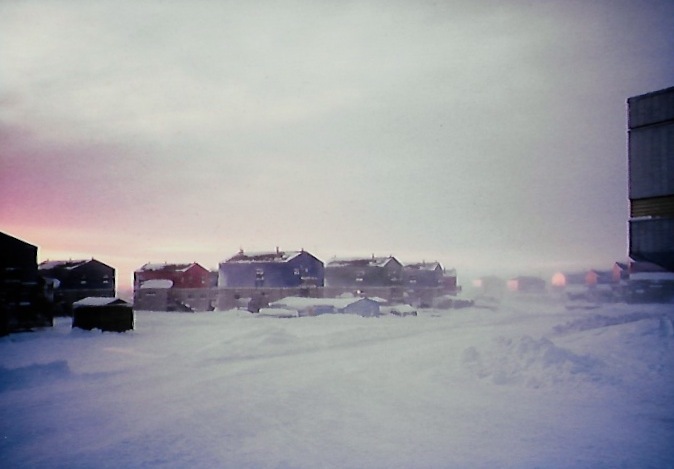 I looked out of the window at J.’s apartment in Puvirnituq, and I could barely see the lights from the nearby houses. I’d arranged to meet Murdoch at the hotel, but I didn’t know where it was, so J. called the hospital van, which picked me up. I pushed the heavy metal doors, and headed tentatively down the narrow, carpeted hallway to what seemed to be the hotel’s communal kitchen. “I’m looking for Peter Murdoch?” I said. “You’ve found him,” said an older non-Inuit man, who resumed speaking Inuktitut to a younger Inuk. “You speak Inuktitut!” I said. “Even five-year-olds here speak it. So what’s so unusual about me?” Murdoch said. We went into his small hotel room to talk, just a narrow bed, chest of drawers, a lamp, snow layered against the single window on the outside wall. Murdoch — a tall man, maybe in his 60s, balding hair and a nervous habit of clearing his throat that I ended up editing out of every taped interview. I knew nothing about Murdoch, so he told me about himself. In 1991, he was the general manager of the Fédération des Co-opératives du Nouveau-Québec, then an association of 12 co-operatives in northern Quebec. But he had started off as a Hudson’s Bay Co. employee back in the 1940s. Then, as a young man from Newfoundland, he was sent to Baffin Island to run trading posts. And, he learned Inuktitut and the Inuit way of life. Often he was the only white man in a settlement. In Pond Inlet, on the northern coast of Baffin Island, he’d spend the long days of spring and summer out on the land, sometimes walking for days. He found a people with values he admired. As he spoke, I was brought back to a North that seemed almost a perfect society. Murdoch first came to Puvirnituq with the Hudson Bay Co. in the early 1950s, when people were still living on the land in camps, not far from the trading post. In Pond Inlet, thousands of seals could be found on the ice year-round, but in Puvirnituq, he found a much poorer environment. The fledgling community then consisted of a trading post, a dwelling, a small shack and a couple of snow houses. That’s all there was. Two small camps were located within walking distance, one with eight or 10 snow houses, the other with four or five. People were hungry. There was a lot of sickness. At that time people would sell a small carving for tea, the next day for flour or lard to make bannock. “Sort of a dead-end sort of life,” he told me. Murdoch walked around the camps, bringing medicine, getting to know the people. That better way was to try and pool resources to invest in purchases that would improve the standard of living for everyone, like buying a new boat or more ammunition. Part of all sales from carvings would be used collectively — and the camps would decide what do. An election was held, and the camps voted a leader. It was all self-motivated, Murdoch said. It was the beginning of the co-operative movement in northern Quebec. “It was never,” he said with emphasis, “a community development project” — the kind of government-sponsored projects that are imposed from the South by people from the South. The market for soapstone carvings was just beginning in the South when Murdoch visited those camps. 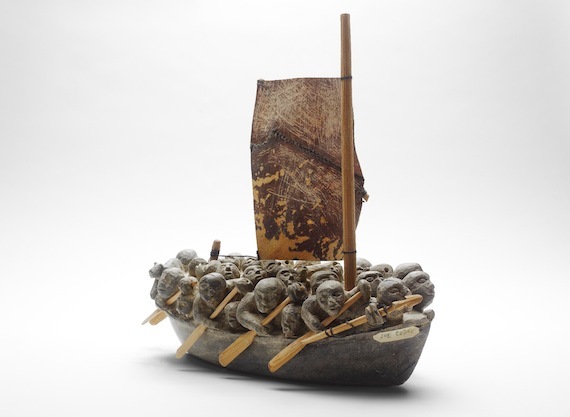 And sales of carvings would be the base of the co-operatives that grew up at the same time that Inuit were moving off the land, into communities. Inuit in Puvirnituq were good carvers, he said. I knew little about Inuit art the night I spoke with Murdoch, but I was wondering why the print shop closed. I had climbed through snowdrifts to reach this small building, now locked and boarded over. Murdoch told me that it was because welfare pays more than art today. The recession in the South had cut art sales. Printing was an expensive operation, so it was the first casualty. Now, the co-operatives couldn’t afford to buy all the carvings that are produced, so people were giving up carving, too. There had been 60 carvers in Puvirnituq a few years earlier. When I met Murdoch, only about 10 men seriously carved. The co-ops were suffering too in 1991, because, to keep consumer prices reasonable, they needed to have some other source of revenue as a subsidy, Murdoch said. But the co-operative way of doing things, he said, was no longer being encouraged by government, as it was in the 1960’s, and Inuit themselves were becoming drawn to the new development corporations that feed on land-claim settlement money. That night Murdoch brought me from an idyllic past where Inuit life was tough, but pure, almost a reflection of the stereotypical soapstone imagery, back to today’s difficult, modern reality. He was telling me that there was a battle being fought between big forces, different ways of thinking, of living, of doing business. Inuit may be the casualties, and no one’s doing or saying anything, he said. Inuit strengths are disappearing. Murdoch’s disillusionment struck through me, like a bolt. After two hours of listening to Murdoch, I ended the interview. I didn’t know much then about Inuit and the co-operative movement he worked for, but I was moved by his vision. On my way back from the hotel to J.’s, I almost got lost, stumbling through the snow, following the pale lights from the windows of houses and the howling dogs as guides. I did my first short radio documentary for the Canadian Broadcasting Corp.’s national radio network on Peter Murdoch and the plight of Inuit carvers in the North. But a producer in Toronto said “why should we care about this? A few Inuit that don’t have enough money for new snowmobiles?” and killed the piece. You can read the first entry here. ← Like an iceberg, 1991…cont. I enjoyed reading this blog post Jane – Peter Murdoch’s experience in the North explains it so well. He has been so instrumental in building up the FCNQ in supporting the cooperative movement in Nunavik. The first several co-ops were established before the Inuit organizations such as Kativik Regional Government, and others, ever existed. The basis of the creation of the cooperative associations was so that Inuit could develop their own resources without having to rely on outside sources, just as Peter says, it was self-motivated. Their goal was to achieve autonomy. 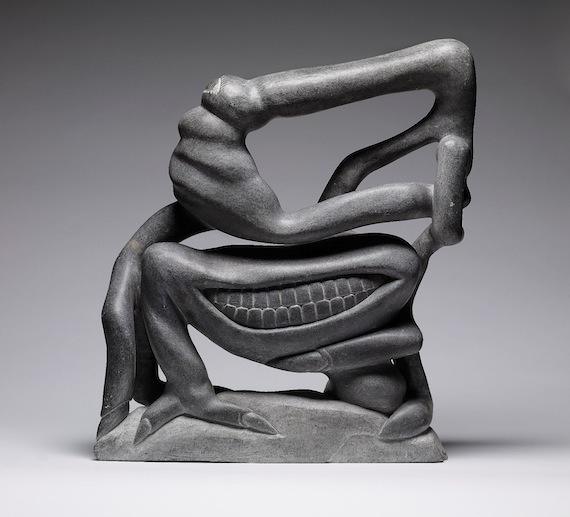 In Puvirnituq in 1958 the sculptors were able to use their artistic skills to build up their co-op, and in 1959 and 1961 respectively, Kangiqsualujjuaq and Kangirsuk built up their co-ops first by selling abundant Arctic Char. You speak of a recession at the time of your interview with Peter Murdoch in 1991, and Inuit carving could no longer be a viable way to allow for further growth. 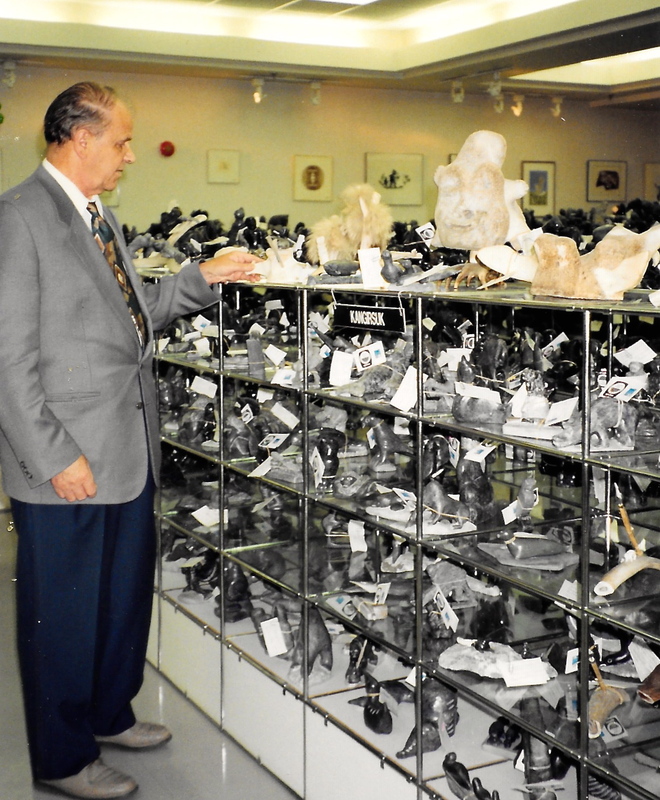 We see more recently again that since the last recession (2008) Inuit carvings have experienced a slump in sales. Peter Murdoch saw a need to support Inuit carvers and it is unfortunate that CBC nixed the show you had been preparing. Today not only do Inuit sculptors still need support but I also think that a kind of revitalization movement could be helpful. I would love to see a return of popularity of this beautiful art.